From applying for your first learner's permit to transferring your license to a different state, there are several reasons why you might have to take a written driving test. 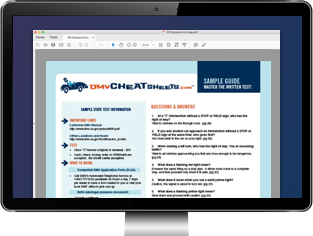 While testing policies can vary from state to state, here's what you can expect to find on most written driving tests, and what you need to remember to get a passing score. Show proof of residency for the state in which you are applying. Have completed the driver's education program. Be sure to confirm what documents you'll need in your home state by visiting our licensing pages for teens or adults. Once you have completed all of the requirements, you'll be eligible to take the written examination. EITHER a paper or computerized multiple-choice exam. Some states have recently implemented computerized exams that randomly select questions for each test taker. The number of questions on the exam to vary according to your state. EXAMPLE: Massachusetts' test consists of 25 questions; Nevada's test is 25 questions. Scores to be based on the percentage correct. Passing percentages will vary according to the state. If you prepare the right way, it's possible to pass the written road test on your first attempt. Study your state's driver's manual. The questions on the test are automatically generated from the information in the manual. Take advantage of practice examinations. Practice tests will provide you with the same type of questions you'll see on your state's written exam. Taking several tests prior to testing day is a good way to gain comfort with the format of the test and ease your nerves. If you notice you consistently miss questions from one particular section, you'll know you need to study those sections more before you take the actual exam. If you don't know the answer, have a strategy. If you're not confident in a few of your answers, you can usually eliminate some choices that you know are not correct. This will improve your chances of selecting the correct answer. Calming your nerves and being confident in your knowledge are two important aspects of being a good test taker. If you've studied and prepared the right way, you'll have nothing to worry about. Remember, too, that if you don't immediately earn a passing score, most states will allow you to retake the examination.